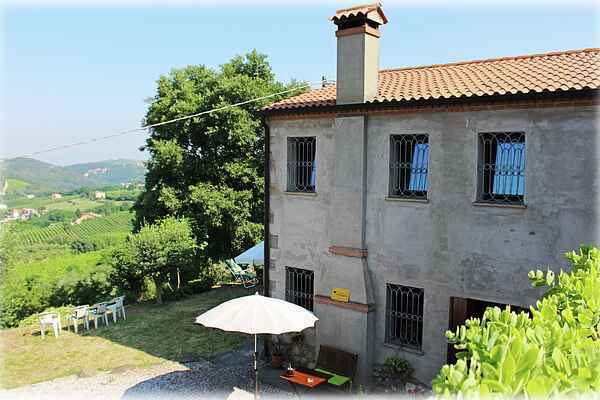 This comfortable country house for holidays on two levels is peaceful surrounded by the green hills of the Regional Park Colli Euganei and is located in Cinto Euganeo (province of Padua). It is divided into 3 accommodations and surrounded by a big garden (500 square meters) and situated on a estate of 2 hectares with a forest and lots of fruit trees, with a view over the picturesque hills. The house borders along that of the hospitable owner. On request, you can use the cosy stone oven to e.g. organize a BBQ. The sleeping area is on the upper floor, in front of the house there is a terrace equipped with tables and chairs, it is ideal for the outdoor dining. In the surrounding: het thermal-area famous for their mud-bath treatments and swimming pools (Abano, Montegrotto, Battaglia) within 13 km, the medieval hamlets of Arquà Petrarca and Este (monumental towns) within 6 km, Padova within 29 km, Vicenza within 38 km. further: Venice and the Garda lake within 1,5 hrs. drive. The owner will gladly advise on events, monuments, festivals, fairs and sports possibilities in the area.